I have not been able to figure out the issue, but it seems like when I have a certain Pie Chart on my page the page starts to hang and get a spinner and the page becomes unresponsive. I can still close the window, change the URL, refresh the page, but I cannot interact with the DOM or my application. It happens every time, where if I turn this pie chart off, everything works like normal. I have a different pie chart where this NEVER happens. One difference between the two was one uses icons and one does not. I tried disabling the icon on the problematic pie chart, and that did not work. I went to check your demo page to see if it was just me, and the same thing happens if I try to most of your pie chart examples. I do not seem to have any issues opening demos of any other types of charts. Have you seen this before, or have any advice? Most of our Mac users are currently out of the office so I cannot check if they are using the same Safari version (found just one with 9.1.3 version, now updating), however while the last series of Apple updates have caused some problems, we haven't noticed anything this serious. That said, Safari tends to be the most problematic, if I remember correctly, we had one computer that exhibited similar issues of non-responsiveness. In some cases the browser had to be restarted (Chrome also tends to become less responsive with time, mostly if developer tools are open), sometimes there was some relation with external monitor and/or its resolution. But these issues came and went, they were never persistent or repeatable on different computers. Can you please send us some of the examples that hang persistently? What device (CPU/GPU) are you using? 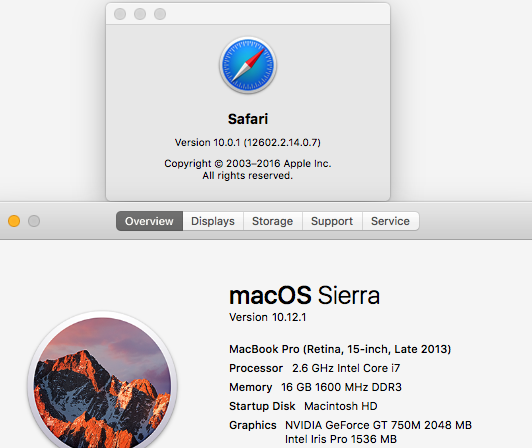 I'm the person who also has Safari 10.0.1. I can't seem to reproduce the hanging, but I notice that in some examples (in the documentation page) the code sample positions itself to the left of the piechart (instead of below, as it should). In that case I cannot interact with the piechart because the code sample has somehow overshadowed it. Trying to click and drag over the piechart results in text being selected in the code. This is certainly a bug, and we'll fix it, but it's not the one you're describing. Can you perhaps send a link to one of our examples that it is always hanging for you? Also, perhaps you have some addons or other software that affects how the browser is working (AdBlock maybe or something)? Thanks for the responses everyone. Here are some of the examples that have issues for me. I also verified with one of my co-workers who is on the same version of Safari, and she runs into the exact same issue. I have no external monitor attached to my laptop when exhibiting this behavior. I am using a clean install of Safari with no addons or special settings (beyond dev console) enabled. This behavior happens with or without the console open. Please let me know if you need any more info. When my colleague gets online I will ask her for her computer stats as well and send them over. 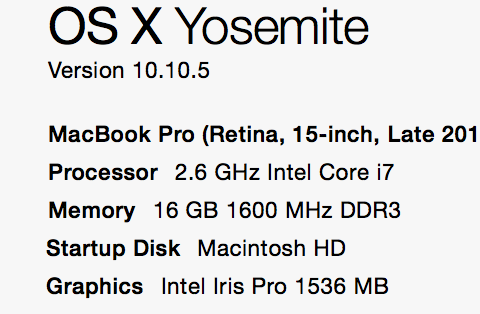 Hmm, the only noteworthy difference (besides hardware) that I can see is that my Mac is OS X El Capitan 10.11.6. Perhaps that's it, but for me it all works smoothly. Say, could you try the same on Chrome or Firefox and see if that happens there too? It sounds like there's an infinite loop there somewhere and I know for sure that at least in Chrome you can debug it - sort of. In Chrome, if your dev console is open when the loop starts, you can click "pause" in the "Sources" tab and see some callstack for the loop. (If it's not open when the infinite loop starts, you won't be able to open it) I don't know if this is so in Safari, but maybe. Anyways, if I could see some stack trace, it would be great! I will see what version of OSX my co-worker is on to compare and get back to you. I have been meaning to upgrade, but I was waiting until after the new year and a deadline we have so my computer doesn't get really slow on my before that! If my co-worker is on the same OSX as I am, I will try to find someone internally who has upgrade to see if they get the same behavior as you. I never see these issues in FF or Chrome for any of the pie chart demos. Clicking the pause button doesn't seem to show the code being in any loops in chrome. I live in San Diego California, so my time zone is set to PST. All of my language settings are English. One change that we added in 1.16.0 is that now it allows the canvas to scale up to 4096x4096 px while previously it was maximum 2047x2047px. https://jsfiddle.net/eukwk8kk/1/embedded/result/ (this has no changes, just to see if it hangs in jsfiddle as well). Hmm... if it's the canvas size, then there's a simple test - try making the browser window smaller. It's a good idea, we here have 13" MacBook Retinas, so that could explain it. Could you please see if this example hangs:https://jsfiddle.net/eukwk8kk/1/embedded/result/ (this has no changes, just to see if it hangs in jsfiddle as well). I tried both of these examples with both my browser at full screen size, and with it just about a quarter of my screen. I see the bad behavior in BOTH examples, although it does seem to take longer to show up with the second example. The first one pretty much goes to spinner right when I try to interact with the chart. The second example seems to allow me to make a few clicks with animations before freezing up. I believe I found someone with the latest OS in my company, so I'm going to reach out to them and see if they see this behavior or not. Please let me know if you would like me to test anything else. After a little while, the tab will change to Safari Web Content (not responding), and it shows as not responding in force quit dialog. You can still close the browser or refresh the page like normal without force quitting. The fan of the computer starts to spin heavily. I ended up screen sharing with a colleague whose computer stats are below. The behavior DOES NOT happen for him. Everything works as expected on his computer. So this does seem to be an issue with the version of MacOSX as opposed to the version of Safari. Seeing as the people seeing the issue are a few versions back, we will probably not worry about it from our end, but I need to confirm with the powers that be. Let me know if you need any more info though. As a side note, I believe we also have someone who is on the problematic version of OSX but on an older version of Safari (9 something) and everything works normal for him. I am using this demo quite extensively and I have not had issues on my Mac or iPhone or iPad. We just run into a very similar issue on Safari 10.0.1 and macOS 10.11.6. In this case we have a rather large method (drawing nodes on GeoChart) where the code just hangs once we hit 10 nodes. However if we comment out few lines of code that are not even executed, the issue goes away. We have yet to test if updating macOS on that computer resolves the issue but if it does then we are not sure if it is worth just refactoring the code hoping that we hit something where the specific Safari version does not break since we might as well be creating the same issue elsewhere. If the latest version will exhibit the same issue we will try to submit a bug report for the browser. Just out of curiosity, you said this has to do with the GeoChart. Do you think the same problem is what was causing issues to the Pie Chart? While I have no proof, at this point it seems to be the best guess. Our case was similar - sometime the hang was immediate, sometimes after a little time, some charts did exhibit it, some though very similar, did not.